The first theme of the Budget is diversifying our economy to create wealth for Hong Kong and to provide quality job opportunities and better choices of career development for our young people. The second theme is investing for the future and the third one being caring and sharing. This year, the economy is expected to grow between 3% to 4% in real terms. Last year, the growth was impressive, about 3.8%, the growth momentum carrying on into this year. In terms of inflation, the underlying inflation is estimated to be about 2.5% – still relatively low, although edged up a little bit from that of last year. We have also taken the opportunity to take stock of what is happening around the world, because we are a very small and open economy. Anything happening outside in the world will unavoidably (affect) us. You are from the business sector so I’m sure you are well aware of this: the first mega trend is the unstoppable wave of innovation and technology which not (only) changes business models but also affects the (lives) of many. Under the 13th Five-Year Plan, the Central Government pledged to support us not just to continue to develop into a premier financial, trading and shipping centre, but also pledged its support to us to develop innovation and technology as an industry, also with support to us to further enhance our professional services. Two other major initiatives, the Belt & Road and the Guangdong-Hong Kong-Macao Bay Area, also present unprecedented opportunities for Hong Kong. In terms of the role of the Government, the way we see it is that Government is not just a public-services provider, not just a regulator, but in the context of economic development we need to play the role of facilitator and promoter. That’s why in the Budget, when we want to develop innovation and technology as a sector for our future economic development and also as a force to cut across different industries to enhance our overall competitiveness, the Government took the initiative to set aside in this year’s Budget over $50 billion to support the innovation and technology sector. And in fact, even in sectors that we are perceived to have competitive advantage, say for example financial services, there are also areas that we can do better. That’s why you can see in the Budget I set aside $500 million to sustain growth and to help us develop areas in financial services that we are not yet at an advanced stage, say for example the bond market. We are going to provide incentives for issuers who have never issued bonds in Hong Kong in the form of subsidies from the Government to the extent of 50% of their issuing expenses and each issuer can claim up to two times – each time about $2.5 million as a cap. So that is something quite unusual when you compare with our past practices. I give you these two examples with a view to illustrating the position taken by the Government with regard to economic development. For areas that we perceive to have potential, areas that we do think will benefit us in the long term, we won’t hesitate to put resources to that area. And that also applies to, say for example, tax policies. As you may be aware, we are contemplating draft amendment bills to the Legislative Council to enable us to allow super deduction for R&D expenditures. In terms of innovation and technology, maybe one point I should highlight: out of that over $50 billion, $10 billion is allocated to develop two research clusters – one is on healthcare technologies, the other is on artificial intelligence technologies. The idea is to provide infrastructure and also to allow the Government to provide financial incentives for us to attract renowned overseas or Mainland research institutions, universities and tech companies to come to Hong Kong, to bring along with them also talent. It is because the core competitive factor to ensure the success of innovation and technology is human capital, is talent. We are strong in certain areas in the universities, but if we want to develop that particular sector we need to have a critical mass. So the idea is to provide this platform and incentive so that we can attract more of those institutions to come to Hong Kong, to move some of their research here and to bring along their talent, so that we can take that opportunity also to nurture our own talent, and to be able to create a critical mass of such talent to allow us to bring the industry forward. Perhaps at this particular juncture it is worth noting that in terms of public expenditure as a percentage of GDP, we have removed the previous cap of public expenditure not to exceed 20% of our GDP. For the coming five years, this percentage will be about 21%. That will give us about $24 billion additional resources for us to use in terms of recurrent and capital expenditure. That is quite something. But this is, let me assure you, a prudent move because, number one, we have very strong fiscal reserves to enable us to do that, secondly, when I take stock of our revenue in the past decade, the total revenue of the Government each year is about 21% of our GDP, so raising that cap is still within our affordability and would enable us to invest in the areas that we need to catch up, say for example healthcare. This year in the Budget I allocated $300 billion from the fiscal reserves, asking the Hospital Authority to advance the planning of the second 10-year hospital development plan and to ask the universities to increase their training capacities for doctors and healthcare professionals in order to prepare ourselves for the fast-ageing society. (For) our revenue and expenditure situation in the coming five years, it is by and large a break-even situation. And in terms of total expenditure in the year 2018-19 it is about $557 billion, which is about $110 billion higher than five years ago. And if you project that into the future five years, by the end of 2022-23, it will reach about $695 billion. So the increase in expenditure is substantial and that demonstrates one point: that is for this term of Government, we will not be keeping the reserves in the bank but we will make good use of that money to invest, no matter it is in healthcare or education or to invest to foster the development of our economy. Financial Secretary Paul Chan gave these remarks at the Joint Business Community Luncheon on the 2018-19 Budget on March 28. It really gives me great pleasure to come to Art Basel 2018. I’m no stranger to Art Basel. It is four years ago at the second edition of Art Basel I was standing here to witness the opening of this world’s premier contemporary art fair in my then capacity as the Chief Secretary. I still remember, on that particular occasion four years ago, I said Art Basel will certainly become a very significant event in Hong Kong’s cultural landscape, and it turns out to be even better than I could have imagined. In the last four or five years, Art Basel has really helped us to build Hong Kong into a cultural hub, bringing a lot of world-class arts exhibitions and galleries, and what is most exciting is audience building. Last year, I saw queues of people, members of the community, queuing up to come into Art Basel to have this feeling of arts appreciation. This closer relationship between Hong Kong and Basel is something that I find very gratifying. These days, whenever I go out to promote Hong Kong, I usually end my speech with a tagline, and that is “The best of Hong Kong is yet to come”. It certainly is true for the arts and culture scene in Hong Kong, because we are now seeing our West Kowloon Cultural District starting to have its physical presence and in due course Hong Kong will bring in two wonderful museums. One is the contemporary art M+, 66,000 sq m. The other is a latecomer – it’s the 30,000 sq m Hong Kong Palace Museum. And we’re also expanding the Hong Kong arts museum by almost 40% in a couple of years’ time. So the future looks extremely promising for arts and cultural development in Hong Kong, and I welcome more arts people to come to enjoy and share our excitement. 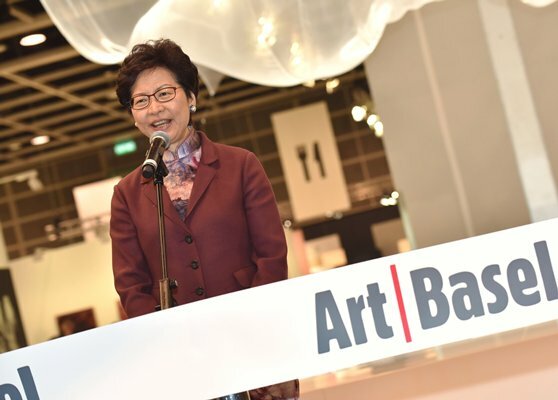 Chief Executive Carrie Lam gave these remarks at the Art Basel Hong Kong opening ceremony on March 27. We certainly have one of the prime prerequisites for playing a hub role in biotech. And that’s our globally prominent financial market. One of the world’s leading financial capitals, and China’s major international financial centre, Hong Kong is indisputably well suited to meet the varying financial needs of biotech companies, whatever their size and whatever their stage of development. When it comes to biotech companies, the sector faces singular revenue and cash flow challenges due to the long and costly journey inherent in turning biotech research into effective products and applications. Following the general principles laid down by our Financial Leaders Forum, the stock exchange launched a consultation, in February, on establishing a new listing regime for emerging- and innovative-sector companies, with a view to boosting Hong Kong’s competitiveness as a listing platform. With regard to biotech, we propose – subject to appropriate safeguards – to allow the listing of biotech companies that don’t meet the financial eligibility requirements of the stock exchange’s main board. Let me add that the Financial Leaders Forum set up in August last year, chaired by myself, is made up of prominent members from the financial services sector as well as top leaders of our financial regulators. 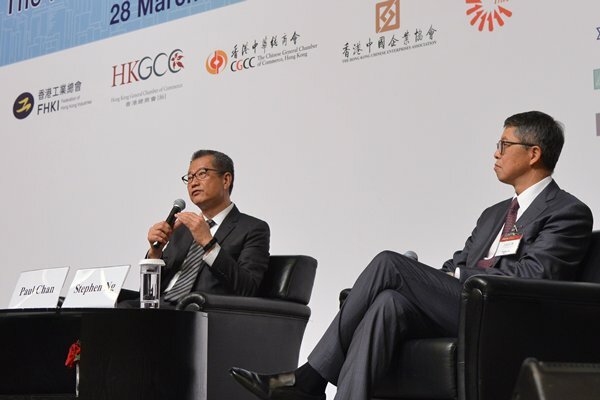 One of the key objectives of the forum is to examine strategic proposals that will further enhance Hong Kong’s position as an international financial centre. It reflects the Government’s determination to play the proactive role as a facilitator and a promoter and to pursue promising new opportunities in a forward-looking manner, and to support industries in which Hong Kong enjoys advantages and potential. While financing is essential to the success of biotechnology, money alone won’t ensure success. In that regard, the fundamentals for a flourishing biotech industry are well in place. And in my recent Budget, I am setting aside additional resources to the order of over $50 billion to strengthen our work in these areas. The Hong Kong Science Park, our flagship technology centre, will be provided additional resources to enhance its research-focused infrastructure and the support to its dynamic international and local tech tenants. The Innovation & Technology Fund will also receive additional injection to continue its critical support to applied research and development. Another key initiative I would like to highlight is the establishment of two research clusters – one for healthcare technology, the other for artificial intelligence and robotic technologies. The objective is to attract more renowned international research institutions and technology companies to come to Hong Kong and to bring in more experts from around the world, thereby helping us nurture our home-grown talent. I’m confident, let me add, because of our encouraging track record in this regard. For example, in late 2016, the celebrated Karolinska Institutet of Sweden opened its first overseas research facility for reparative medicine at (the) Science Park. In September last year, the Massachusetts Institute of Technology (MIT) opened its first overseas Innovation Node here, providing entrepreneurial education and training for students and researchers from MIT and also from Hong Kong. Ladies and gentlemen, the message is clear: we are determined to make Hong Kong among the world’s most desirable destinations for biotech companies. 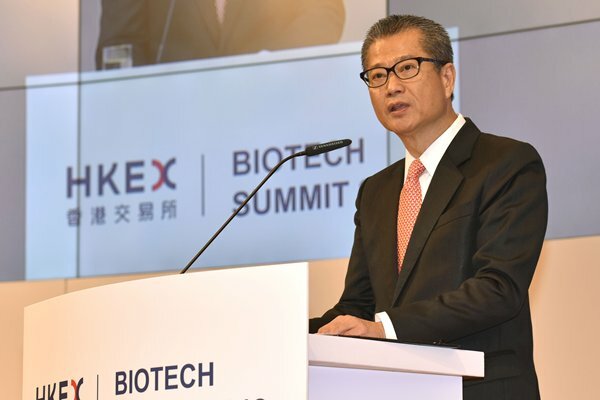 Financial Secretary Paul Chan gave these remarks at the HKEX Biotech Summit 2018 on March 22. The Government is committed to promoting STEM education to nurture young talents in the face of rapid scientific and technological development worldwide. The Chief Executive, in her inaugural Policy Address last October, stated that the Government will collaborate with tertiary institutions and other relevant organisations to arrange more large-scale quality activities, namely education fairs related to science and technology, to provide more opportunities for students to apply what they have learnt and share their learning with each other. The STEM Education Centre newly set up in the Arts & Technology Education Centre at Lok Fu has also commenced operation to provide training and relevant teaching support to primary and secondary school teachers and students. In parallel, the Education Bureau has updated the curricula of STEM Education Key Learning Areas, and completed the drafting of a supplementary document on “Computational Thinking-coding Education” for use by schools. To further arm the leadership and management tier of all primary and secondary schools with relevant skillsets to plan and implement school-based activities related to STEM, we have launched a series of intensive training programmes as part of their professional development. However, the Government’s effort alone is not enough. We need the support of relevant sectors like the ICE Hong Kong Association and general public, particularly on young people, to promote STEM education and further enrich our students’ learning. The exhibition of the longest Lego bridge in Hong Kong is a shining example of how the community can help raise the interest of the general public in innovation and technology and allow our students to have a positive experience in applying engineering knowledge in daily life. Chief Secretary Matthew Cheung gave these remarks at the “Exhibition of World’s Longest Span Bridge LEGO Bricks” opening ceremony on March 21. Unlocking new ideas and applying technologies is one of the main themes in my Policy Address delivered in October last year. I spoke at some length about the promise of innovation and technology in Hong Kong, its potential in helping to diversify our economy, improve livelihood and creating quality jobs especially for our young people, as well as committed to a clear strategy for innovation and technology development in Hong Kong. Just three weeks ago, our Financial Secretary delivered his annual Budget Speech and allocated more than $50 billion – that is about £4.5 billion – to accelerate innovation and technology development in Hong Kong. 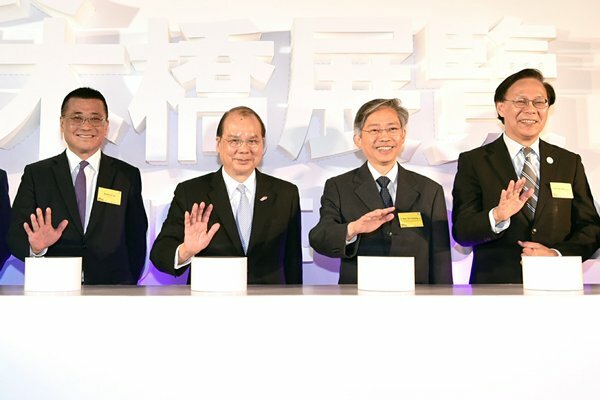 Among the measures is the establishment of two research clusters on healthcare technologies and artificial intelligence and robotics technologies, to attract the world’s top scientific research institutions and technology enterprises to Hong Kong for conducting more midstream and downstream research and development projects in collaboration with local universities and scientific research institutions. A bill to introduce tax incentives for corporations to increase their spending on R&D will shortly be introduced in Hong Kong. The many top institutions and enterprises in the United Kingdom, some of which I interacted with during my visit to London last September, are clearly our targets. We are also in the midst of remaking Hong Kong into one of the world’s smart cities, transforming the way we live and work. In December last year, we unveiled the Hong Kong Smart City Blueprint. It sets out our vision for building a smart Hong Kong powered by a thriving economy and a high quality of living. A good deal of that is already well established. Our telecommunications network, for example, is world class, with fixed and mobile broadband speeds and penetration rates among the highest anywhere. At the same time, there is a lot of potential in applying innovation and technology in many industries. For example, Hong Kong has long been renowned for its high-rise infrastructure, as well as the construction, design and management industries that support it. We are looking to innovation and technology to drive its future. My Government will help lead the way, as beginning this year, we will adopt Building Information Modelling technology in the design and construction of major government capital works projects. And we are setting up a $1 billion Construction Innovation & Technology Fund to encourage industry to adopt innovative technology. We see the advantage, too, of expanding the reach of innovation and technology in government. Plans include heightened training in innovation and the application of technology for our civil servants. In addition, a big-data analytics centre will be in place by 2020, introducing real-time data transmission and sharing among government departments. In the coming year, we will also adopt public cloud services for government departments. Soon after, we will revamp the government’s cloud infrastructure, enabling digital services delivery among government departments, service providers and others. A soon to be established Policy Innovation & Co-ordination Office will be tasked to review existing legislation and regulations with a view to removing outdated provisions that impede the development of innovation and technology. We are also examining government procurement to make sure that innovative solutions will not be overlooked. We are focused, in short, on building a new model of development. This fstival surely underlines the creative and entrepreneurial spirit that drives the collaboration between Hong Kong and the UK. It was also the catalyst for a joint statement on “Closer Collaboration between the UK & Hong Kong on Trade & Economic Matters”, which was announced earlier today. That statement naturally embraces free trade. Hong Kong and the UK enjoy close trade ties, and our bilateral trade increased 4.4% last year. The UK was Hong Kong’s 13th largest global trading partner in 2017. In services, the UK was our third largest partner in 2015. And the UK, at the end of 2016, was Hong Kong’s eighth-largest source of inward direct investment. Not surprising, with more than 670 UK companies doing business in Hong Kong, and using Hong Kong as the gateway to markets in Mainland China and throughout the Asia region. The joint statement also singles out creative industries and the promise they hold for our two economies. In 2016, Hong Kong’s creative industries employed about 135,000 professionals in areas ranging from design and the arts to communications, animation and film. Hong Kong has long been a global centre for filmmaking and film talent. Over the past two years, some 30 UK production companies have turned to Hong Kong for location shooting. And Hong Kong looked to the UK for some $3.8 billion worth of creative goods in 2016, from jewellery to books, particularly, I’m told, children’s books. Chief Executive Carrie Lam gave these remarks at the GREAT Festival of Innovation reception on March 21. While Hong Kong prides itself on a free market economy and a vibrant private sector, when it comes to hospital services the public sector, namely through the 42 hospitals and institutions of the Hospital Authority, remains a major provider, taking care of some 90% of all in-patient treatment in terms of in-patient bed days. Knowing how much Hong Kong people treasure this safe, quality, accessible and affordable system, as the Chief Executive, I have no intention to make fundamental changes, except to strengthen its management and relieve its work pressure. Hence, this term of the Government has significantly increased its annual subvention to the Hospital Authority and has committed to an extra $300 billion capital works programme to support the second 10-year hospital development plan, improve the clinic facilities of the Department of Health, and upgrade and increase healthcare training facilities. This is, I should add, on top of the $200 billion committed through the first 10-year plan. But that does not mean we should not promote public-private partnership in order to make better use of our resources and to provide more comprehensive and choice care for our people. Indeed, the mix of public and private sectors in our healthcare services has served Hong Kong well for decades. 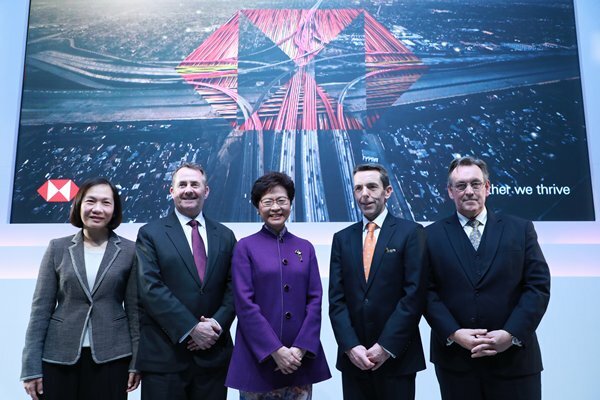 With world-class additions such as Gleneagles, that system will no doubt become stronger, more efficient and better equipped to respond to the varying needs of the people of Hong Kong. The opening of Gleneagles Hong Kong Hospital also underlines my Government’s commitment to promoting private sector services where appropriate, and facilitating the adoption of standards to meet public aspirations. This Hospital provides 500 beds, day procedure services and a variety of specialist out-patient services. And it is the second private hospital in Hong Kong offering 24-hour accident and emergency services. In the land tendering process, and through the service deed entered into between the Government and the hospital, local residents are guaranteed at least 70% of in-patient bed days, and that more than half of in-patient services to local residents will be provided through package plans. Gleneagles’ transparent fee-charging system ensures cost certainty and transparency, which will go some way towards addressing patients’ main concern in using private hospital service. I hope this will have a demonstrating and benchmarking effect and our other private hospitals will soon follow suit. The Government announced earlier this month details of the Voluntary Health Insurance Scheme, which seeks to enhance the protection offered to individuals under hospital insurance. By regulating products under the scheme, the Government hopes to offer the public a new choice of insurance products with comprehensive coverage. The scheme, together with the proposed tax deduction for the premium, should encourage more people to use private healthcare services through hospital insurance, thereby relieving the pressure on the public healthcare system in the long run. We are, let me add, strengthening our regulatory regime for private healthcare facilities. A bill to that effect is now with the Legislative Council and will cover a wide range of facilities, including private hospitals. Under the bill, licensed facilities will have to comply with corporate governance, complaint management, price transparency, infection control and other requirements. The bill will help protect patient rights and safety, while encouraging the good growth of our private healthcare sector. Our population is ageing rapidly, and the rising demand for healthcare services is a challenge we all have to face. The Government will pool all efforts to rise to this challenge by investing in research and development, promoting innovation and technology and driving greater cross-sector, cross-profession collaboration. In short, we are committed to safeguarding the health and well-being of all Hong Kong citizens. 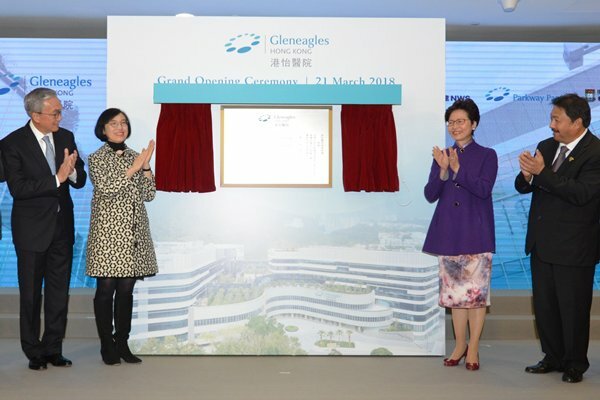 Chief Executive Carrie Lam gave these remarks at the opening ceremony for Gleneagles Hong Kong Hospital on March 21. Hong Kong is home to some 250,000 ethnic minority residents, accounting for 3.8% of the whole population. According to the 2016 Population By-census, the ethnic minority population expanded rapidly in the five years between 2011 and 2016 at an average annual rate of 5.8%, which is much faster than the territory-wide growth rate of 0.5%. The Government is committed to providing equal opportunities for the ethnic minorities and facilitating their integration into our community. To ensure that Government policies can cater for various social groups, the Chief Executive has pledged in her election manifesto that more ethnic minorities will be appointed to different Government statutory bodies and committees so that Government policies can cater for various social groups. While many ethnic minorities have settled in Hong Kong for generations others are new arrivals to start a new life here. Owing to language barriers and cultural differences, some of them do encounter different degree of difficulties in their everyday life. To support non-Chinese speaking students in learning the Chinese language systematically and to assist their integration into the community, the Education Bureau has implemented the Chinese Language Curriculum Second Language Learning Framework in primary and secondary schools since the 2014-15 school year. We are closely monitoring the implementation of the learning framework in schools to collect first-hand information regarding curriculum planning, learning, teaching, and assessment for discussion with experts, academics and teachers so as to gauge its effectiveness. Views of ethnic minorities parents and relevant organisations will also be taken into consideration. To this end, the Zubin Foundation has been our staunch supporter and partner and launched the first Diversity List two years ago. So far, the foundation has identified a number of non-Chinese individuals who are elites of their professions and are devoted to contribute to Hong Kong by serving on government advisory and statutory bodies. I am grateful to note that eight of them have been invited to join 10 advisory committees. We will continue to invite more ethnic minorities from different sectors of the community to share with us their views and suggestions. To provide more opportunities for more diversified participation in policy discussion, we have launched the Pilot Member Self-recommendation Scheme for Youth to invite young people to nominate themselves to specified Government committees. The response to the pilot scheme was overwhelming and a number of applications were submitted by young people from different ethnic backgrounds. I have met some applicants in person and was deeply impressed and touched by their commitment and determination in serving society. While the first phase of self-recommendation has ended, I encourage our young people who are interested in serving the community to put forward your resume to the Home Affairs Bureau for inclusion into the Central Personality Index for consideration by other government committees when they consider appointing new members. It is our aim to double the overall ratio of youth members to 15% within the current-term Government. To enhance collaboration on support for ethnic minorities, we have responded to the earlier advice of some of the community leaders named on the Diversity Lists who are also members of the Committee on the Promotion of Racial Harmony whom I met in August last year and will set up a high-level steering committee to be chaired by me to co-ordinate, review and monitor work in this respect. I am happy today to say that the Financial Secretary has kindly acceded to my suggestion and earmarked in the Budget announced last month $500 million to strengthen the Government’s support for ethnic minorities. We need to get our act together to enhance the well-being of our ethnic minorities citizens, promote their upward social mobility and foster their integration and inclusion into our social fabric. All ethnic minorities are part and parcel of Hong Kong. We cannot and should not leave anyone behind. On legislation, the Race Discrimination Ordinance which is enforced by the Equal Opportunities Commission, was fully implemented in 2009. In 2016, the Equal Opportunities Commission submitted its proposals on the Discrimination Law Review to the Government. Among others, nine recommendations were accorded priority of which seven related to the Race Discrimination Ordinance. These recommendations would provide protection against racial harassment to persons in a common workplace as well as harassment by service providers and service users. We aim to table the legislative proposal of the priority recommendations at the Legislative Council this year. No less important, legislation must go hand in hand with public education to raise public awareness of social inclusion. The Equal Opportunities Commission has spared no effort to promote racial inclusion and equal opportunities through various publicity and educational programmes, including the annual flagship event to commemorate the International Day for the Elimination of Racial Discrimination on March 21. The Government is committed to promoting equal opportunity. We have just completed a review of the Chinese proficiency entry requirements for all the grades of the civil service. The number of civil service grades that have lowered the requirement of Chinese language proficiency has increased by 22 to 53. Apart from this, some departments have employed non-ethnic Chinese to meet specific operational needs, including the Police Community Liaison Assistants, the Race Relation Units of the Home Affairs Department and Employment Assistants of the Labour Department. 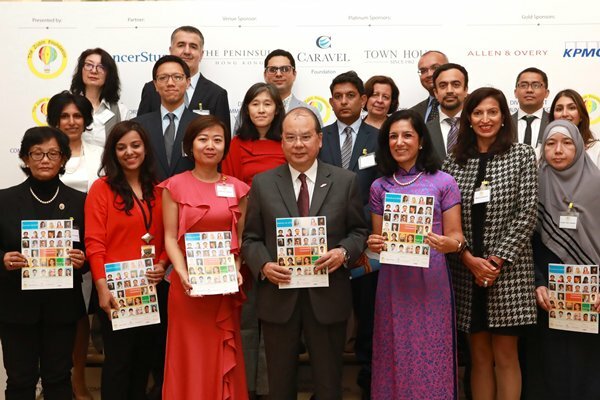 Acting Chief Executive Matthew Cheung gave these remarks at the launch ceremony of Race for Opportunity: Diversity List 2018 on March 20. To sustain our competitiveness, Hong Kong needs to consolidate and enhance our strengths and take a forward-looking and visionary approach to position our future development and seek new impetus. And here I am referring to the bountiful new opportunities brought by the new developments under the national Belt & Road Initiative and the development of the Guangdong-Hong Kong-Macao Bay Area in which we will play an active and important role. They will be the linchpin of Hong Kong’s continuous prosperity. The Belt & Road Initiative proposed by President Xi Jinping offers what the global economy needs in the 21st century – a way forward that we can all embrace, and a future built on co-operation, mutual benefits and friendship. It is an ambitious plan seeking to promote economic and social co-operation among countries and regions that span across Asia, Europe and Africa. It strategically guides the long-term national development and is clearly the driving engine of the regional and even global economy. At present, more than 270 agreements or deliverables have been entered into among the economies along the Belt & Road corridors. These agreements and projects are cross-border with extensive coverage, ranging from finance, infrastructure, trade and commerce, information technology and digital development to agriculture, poverty alleviation, healthcare, environmental protection and conservation. According to the Asian Development Bank, it is estimated that Asia will require an infrastructure investment of US$1.7 trillion per year until 2030. The trade volume of the region amounted to US$10.9 trillion in 2016. President Xi Jinping stated at the 19th National Congress of the Communist Party of China that the Belt & Road Initiative should be pursued as a priority and be given equal emphasis to “bringing in” and “going global”, with a view to breaking new ground in opening China further through links running eastward and westward, across land and over sea. Speaking at the World Economic Forum last year, President Xi said that China is expected to import US$8 trillion of goods, attract US$600 billion of foreign investment and make US$750 billion of outbound investment in a five-year period. Chinese tourists would make 700 million overseas visits. All these will create a bigger market, more capital, more products and more business opportunities, and certainly broader use of the renminbi in global trade, investment and foreign reserves. Hong Kong is destined to play an important role in the development of the Belt & Road Initiative. As a highly open economy with extensive connections and international experience, Hong Kong is the freest market, allowing free flow of trade, capital, goods, talent and information while keeping close ties with our motherland. In December last year, we signed the “Arrangement between the National Development & Reform Commission and the Government of the Hong Kong Special Administrative Region for Advancing Hong Kong’s Full Participation in & Contribution to the Belt & Road Initiative”. The arrangement will allow Hong Kong to give full play to our unique advantages under “one country, two systems” to contribute to our country and, at the same time, seize the opportunities brought by the initiative to give new impetus for our economic growth. The relevant measures will help reinforce and elevate Hong Kong’s position as an international financial, transport and trade centre, promote partnership between Mainland and Hong Kong enterprises, spawn the demand for Hong Kong’s professional services and present our home-grown talents with promising prospects, therefore enhancing the upward mobility of our younger generations. As a member of the Asian Infrastructure Investment Bank, Hong Kong has been collaborating with AIIB and other financial institutions around the world to facilitate infrastructure financing along the Belt & Road. The Hong Kong Monetary Authority’s Infrastructure Financing Facilitation Office (IFFO) has brought together more than 87 partners from the investment and financial sectors worldwide to join hands in the development. Infrastructure development and industrial diversification require enormous investment. In April last year, our Securities & Futures Commission set out the eligibility criteria for infrastructure project companies to list on our stock exchange. These criteria provide a clear pathway for Belt & Road projects looking to Hong Kong for equity and debt financing. With free flow of capital and a deep pool of financial talent, Hong Kong is the ideal place to raise funds for Belt & Road projects. We have a wealth of experience and expertise plus good reputation in carrying out project finance in both public and private markets and a great variety of financing avenues. The Hong Kong Stock Exchange has ranked among the world’s top five in initial public offerings over the past 16 years. The funds raised through IPOs in 2017 amounted to US$16.5 billion. We are, of course, also the largest offshore renminbi business hub in the world, with a pool of RMB618 billion by the end of 2017, handling around 76% of global RMB transactions. We are committed to developing our bond market, fintech, green finance and manpower training and other aspects of financial services. To this end, we have earmarked $500 million for the development of the financial services industry in the next five years. Alongside our expertise in financial services, we have a deep pool of multi-discipline and multicultural talent across different sectors – in law (and particularly arbitration services), accounting, engineering, architecture, management and consulting. Our world-class professionals stand ready to participate in and lead the big ticket of the Belt & Road projects. As a matter of fact, Hong Kong enterprises and professionals are already participating in quite a number of projects in regions along the Belt & Road. Notable examples include the metro system in Saudi Arabia, airports in Cambodia and Sri Lanka, power plants in Thailand and Vietnam as well as a waste management system in Bangladesh. Incidentally, as an aside, the Hong Kong MTR Corporation is operating part of the rail service in Melbourne, Stockholm, Shenzhen, Shanghai and Beijing and Cross Rail in London. This testifies to our world-class professional and project management capabilities. Let me turn to the bay area development, which was first detailed by Premier Li Keqiang in his Government Work Report in March last year, and is a key pillar for the Belt & Road Initiative. With a population of 66 million, roughly the size of the UK, and a collective GDP of US$1.4 trillion, akin to that of South Korea or Australia, the economic potential that could be unleashed from increased connectivity and integration within the bay area is beyond imagination. Its air- and sea-cargo throughput leads the whole world, presenting a central passageway for air, land and sea transport linking countries along the Belt & Road. Hong Kong is a vital and indispensable part of the bay area development. As the gateway for Mainland business to “go global” and the host for over 8,200 foreign and Mainland companies, we are best positioned within the bay area to play the key role in turning the vision of the Belt & Road Initiative into real business opportunities. And these opportunities will translate the bay area development into tangible benefits for enterprises and professionals of Hong Kong, the Mainland and the world. Last July, we signed the “Framework Agreement on Deepening Guangdong-Hong Kong-Macao Cooperation in the Development of the Bay Area” with the National Development & Reform Commission, Guangdong Province and the Macao Special Administrative Region to kick off the bay area development. The State Council will soon promulgate the Development Plan for the Bay Area to provide a blueprint for building a world-class city cluster through complementary co-operation and building synergy among the three places. The Hong Kong Special Administrative Region Government will actively participate in taking forward the development of the bay area in order to create favourable conditions for diversifying our industries, particularly for promoting innovation and technology development. To this end, as the Chief Secretary for Administration, I am chairing the Steering Committee on Taking Forward Bay Area Development & Mainland Co-operation to co-ordinate cross-bureau policies within the administration and formulate concrete work plans for Hong Kong to capitalise on our unique and huge advantages in the bay area. In addition, our Constitutional & Mainland Affairs Bureau has set up the Guangdong-Hong Kong-Macao Bay Area Development Office to strengthen our co-ordination with the relevant central authorities, the Guangdong Provincial Government, the Macao Special Administrative Region Government, and relevant government bureaus and departments, and to proactively approach trade associations, professional bodies and relevant stakeholders to co-ordinate effort related to the implementation of the Development Plan for the Bay Area. Additional resources will also be allocated to the office for undertaking research and publicity on the bay area development to assist Hong Kong people and enterprises in seizing new opportunities. Third, the seventh cross boundary link with Shenzhen at Liantang/Heung Yuen Wai in northern New Territories will provide a fast and direct artery to the eastern part of the Pearl River Delta. It will enhance substantially people and cargo flows across the boundary and support the long-term economic growth of Hong Kong. Furthermore, a third runway project for our airport at Chek Lap Kok is well under way and it is expected to be commissioned fully by 2024. The annual passenger volume is expected to increase from 70 million passengers to around 100 million, while cargo volume will be doubled to nine million tonnes per year. Hong Kong’s links with the rest of the world will be substantially enhanced. These mega projects will also strengthen Hong Kong’s position as Asia’s hyper-connected world city as well as our status as the region’s trade, business and logistics hub. Our strengths make us an important hub connecting China to the world as well as the East and the West. Innovation and technology are exciting and powerful economic drivers that help diversify our industries, raise our operational efficiency, generate new business opportunities, inject creative vitality and allow us to outperform amidst keen competition around the world. Hong Kong can advance the bay area to become an innovation centre for the Belt & Road Initiative. Our extensive international market and transport networks will strengthen connection between the bay area and global markets. Besides, Hong Kong is well versed in international technological trends and technical standards, and offers an enormous base of highly skilled workers, supported by many well-respected and world-class tertiary institutions. To this end, we are vigorously pursuing a strategy of innovation-driven development, and investing heavily in grooming the next generation of IT talents. We have set the goal of doubling our Gross Domestic Expenditure on research and development as a percentage of the GDP to about $45 billion a year, that is, from the current 0.73% to 1.5% by the end of the current Government’s five-year term in June 2022. We have also set aside no less than $10 billion as funding for university research. To give private companies incentives to increase investment in technological research and development, we will provide super tax deduction for expenditure incurred by enterprises on research and development. The first $2 million of eligible research and development expenditure will enjoy a 300% tax deduction and 200% for the remainder. To strengthen our talent pool, we will invest $3.5 billion to boost the quality and quantity of local technology talents, including a $500 million Technology Talent Scheme and an injection of $3 billion into the Research Endowment Fund. To add further impetus to the development of innovation and technology in Hong Kong, we will allocate $50 billion for developing innovation in the areas of biotechnology, artificial intelligence, fintech and building a smart city. The current-term Hong Kong Special Administrative Region Government is committed to be a facilitator and promoter in addition to our traditional roles of a service provider and regulator on all fronts, including strengthening links between Hong Kong and the Mainland as well as other countries, elevating our city’s status as Asia’s world city, attracting Mainland and overseas enterprises and talent to Hong Kong and, in collaboration with relevant organisations and trade representatives, proactively conducting government-to-government interaction dialogue and lobbying. These new roles will certainly apply to our involvement in the bay area development and the Belt & Road Initiative. We are determined to seize the opportunities arising from the national Belt & Road Initiative as well as the bay area development in order to propel our economy forward. 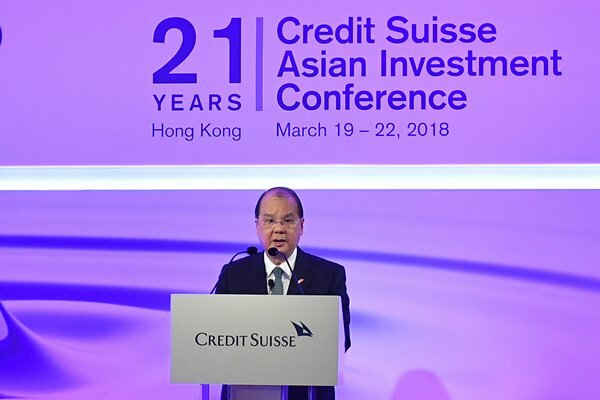 Chief Secretary Matthew Cheung gave these remarks at the Credit Suisse Asian Investment Conference on March 19. I am delighted to learn today is the closing ceremony of the “CFSS (Chinese Foundation Secondary School) · Innovation · STREAM” programme. The programme was launched last year to celebrate the 20th anniversary of the establishment of the Hong Kong Special Administrative Region. I understand that STREAM stands for science, technology, reading and writing, engineering, arts and mathematics education. It echoes well with the STEM education that the Hong Kong Special Administrative Region Government has all along promoted, to enhance the ability of students in the integration application of knowledge and skill as well as nurturing their creativity, collaboration and problem-solving capabilities. Innovation and technology, or I&T in short, are among the top policy priorities of the current-term Government. The Chief Executive Carrie Lam announced in her Policy Address last October that the Government will promote innovation and technology development in eight major areas, one of which is to promote popular science education. To this end, we have updated the curricula of the STEM Education Key Learning Areas, and completed the drafting of a supplementary document on “Computational Thinking – Coding Education” for use by schools. We have also launched a series of intensive training programmes for the leadership tier and middle managers of all primary and secondary schools, to strengthen their capacity in planning and implementing school-based activities related to STEM. The STEM Education Centre newly set up in the Arts & Technology Education Centre in Lok Fu, Kowloon, has already commenced operation to provide training and relevant teaching support to primary and secondary school teachers and students. In parallel, we are collaborating with tertiary institutions and other relevant organisations to arrange more large-scale events for our students, such as education fairs, to raise the interest of the younger generation in science and technology. The permanent exhibitions of the Hong Kong Science Museum will be updated to promote using the museum’s facilities for STEM education. The Hong Kong Science & Technology Parks Corporation also organises STEM programmes for students from time to time. For example, Science Explorer provides tailored tours for students to discover cutting-edge inventions that are changing the world; to learn from successful technology companies direct possible career prospects; and to get into action at Robo Workshop to understand how mathematics, engineering, physics and coding work ensemble in building robots. To engage our young talents early, we will introduce the first-of-its-kind, Mini-Robocon this year for all secondary school students, to promote exchanges of experience in engineering and information technology among young talents and cultivate their interest in STEM education. I encourage all of you to participate in the contests, given CFSS’ outstanding track record in local and national competitions such as the China Adolescent Science & Technology Innovation Contest and the Asian Inter School Robotics Challenge. We have also placed great emphasis on our young talents in drawing up the Smart City Blueprint for Hong Kong. One of the strategies and initiatives that we have adopted is to provide enhanced information technology training to secondary school students outside the normal school curriculum, with an aim to attract more students to choose STEM for their education focus and professional careers. Riding on the popularity of mobile devices, cloud services and social media, the Office of the Government Chief Information Officer organises school visits in collaboration with professional associations in the area of information security. In 2017, 32 school visits were conducted to reach out to nearly 10,000 students, parents and teachers. We will continue to organise school visits to instil in students the importance of information security and healthy use of the Internet. For more than a decade, the Innovation & Technology Commission has hosted an InnoTech Month every year to organise a wide range of innovation and technology-related activities across the city. This year, the InnoTech Month will be held in around October to help raise further the interest of the public in I&T through InnoCarnival, exhibitions, roadshows, workshops, guided tours, seminars, talks and science competitions. The Internet Economy Summit 2018 to be held next month in Hong Kong will feature a youth programme for the first time. Under the theme “New Impetus for the New Economy”, this annual flagship information and communication technology event will arrange Hong Kong ICT Awards winners to meet secondary and tertiary students to share their experience and views on possible career prospects that our younger generation may pursue in the area of I&T. We also recognise students’ efforts through award schemes, thereby nurturing an I&T culture in schools. Since 2014, a dedicated category of Student Invention/Innovation has been added to the Hong Kong ICT Awards to recognise excellent achievements made by our young inventors at school. 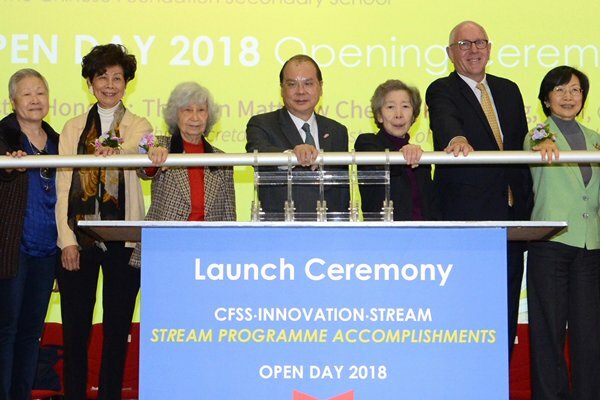 Chief Secretary Matthew Cheung gave these remarks at the opening ceremony of the Chinese Foundation Secondary School Open Day 2018 on March 16. The financial services industry, contributing almost 18% to our GDP, has long been the linchpin of the Hong Kong economy. And as it continues to elevate its game, getting the regulation right and keeping it right is no easy trick. The pitting of principles, rules and laws against the very real needs for innovation and freedom requires fine balancing and sometimes creates sparks. In order for Hong Kong to stay competitive and maintain our growth momentum, we need to be innovative as well as proactive. This is the reason why the current-term Government, which took office in July last year, is adopting a much more proactive role in driving Hong Kong’s economy and enhancing our competitiveness. We will be playing the role as a facilitator and a promoter with a forward-looking and strategic perspective. We will introduce measures to support industries where we see development potential and new markets. In this regard, we have been launching new initiatives to promote the development of innovation and technology as well as financial services. On financial services, the Government set up the Financial Leaders Forum in August last year, chaired by yours truly and comprising leaders of key stakeholders and the financial regulators. One of the key objectives of the forum is to examine strategic and forward-looking proposals aiming to further bolster Hong Kong’s financial prowess. Last September, following discussions at the Financial Leaders Forum, we announced enhancements to the Hong Kong Stock Exchange’s decision-making and governance structure for listing regulation. These will enable listing policies and regulatory procedures to respond to market changes more effectively. That can only boost the competitiveness of Hong Kong’s listing platform, reinforcing our status as a premier capital-formation centre. In doing so we must of course ensure a fine and proper balance between market development and investor protection. We must ensure that market quality will not be undermined as well. The Stock Exchange has proposed some safeguards, from imposing requirements for weighted voting rights’ beneficiaries and limits on their powers to requiring enhanced corporate governance and disclosure. Apart from market development, it is equally important that we continue to review our regulatory mechanisms, in order to ensure the smooth and robust functioning of the financial system and markets and the overall financial stability of Hong Kong. To that end, we track developments in such multilateral institutions and forums as the G20, the Financial Stability Board and the International Organization of Securities Commissions. It’s built on a robust legal framework, effective law enforcement, rigorous preventive measures, capacity-building efforts and international co-operation. These amendments come into operation this month. They will bring Hong Kong’s regulatory regime up to date with the requirements of the Financial Action Task Force, further reducing the risk of money laundering and terrorist financing. These actions will complement the Securities & Futures Commission’s (SFC) enforcement work, which includes vigorously pursuing wrongdoers, seeking remedy and deterring misconduct. I would also like to take this opportunity to update you on some of our ongoing efforts on various fronts in broadening and deepening our financial markets. These schemes help strengthen our securities and bond markets, while opening up the Mainland’s financial markets to the rest of the world. Our city today is the world’s leading offshore renminbi business hub. We count the largest pool of renminbi liquidity outside the Mainland. About 70% of offshore renminbi payments are handled by banks right here in Hong Kong. Then there’s fintech. And I’m pleased to note that our banking, securities and insurance regulators have each launched a sandbox of their own. These provide a welcome and a confined regulatory environment for the testing of fintech projects before they’re rolled out to the public. Alongside fintech, green finance is also enjoying increasing visibility. That visibility extends to the Budget that I presented two weeks ago today. In it, I announced that a green bond issuance programme will be launched, providing funding for the Government’s green public works projects. The inaugural government green bond will be issued later this year. And mark your calendar green for June 14. On that day, the Monetary Authority (HKMA) and the International Capital Markets Association will host the International Capital Markets Association Green & Social Bond Principles Annual General Meeting & Conference in Hong Kong. It will be the first time this flagship international green finance event has taken place in Asia. In the Budget, I also highlighted the potential of Asia’s rapidly expanding bond market and the opportunity for us to take on a larger role. Hong Kong is already a major regional destination for bond issuance but we can and will do more. First, I will expand the scope of Qualifying Debt Instruments, making bonds of any duration eligible for tax exemption in Hong Kong – provided they’re registered with the Central Moneymarket Unit of the HKMA or listed on the Hong Kong Stock Exchange. Second, I will subsidise companies issuing a bond in Hong Kong for the first time, assuming up to half of the issuance cost, capped at HK$2.5 million. And they can claim that subsidy a second time within the programme’s three-year pilot period. 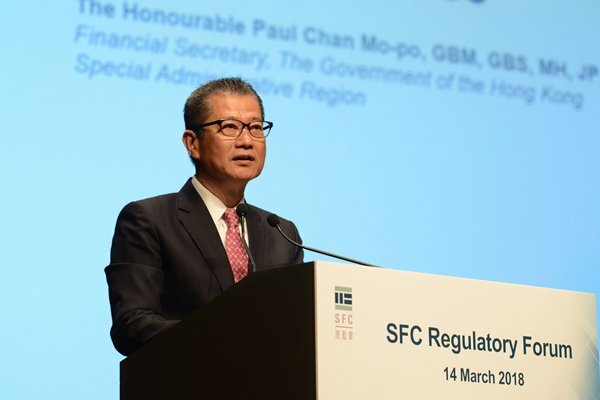 Financial Secretary Paul Chan gave these remarks at the SFC Regulatory Forum 2018 on March 14.